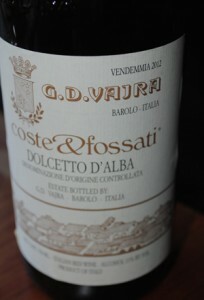 2012 G.D. Vajra, Dolcetto D’ Alba DOC, Coste & Fossati, Piedmonte, Italy. The Vajra Dolcetto Coste & Fossati is like the Grand Cru of Dolcetto, it is very unlike any Dolcetto I’ve had in recent years, the best way to relate it or explain it is say it has varietal correctness, but drinks more like a Barolo, maybe it’s the terroir and vintage, which was severe, I can’t really say, though I can say it is magnificent! The deeply flavored Coste & Fossati Dolcetto by Giuseppe Vajra starts with wild blackberry, sweet herbs, hints of dried violets and bright cherry and plum, it is nicely hued with garnet and blueish with ruby edges and the palate is rich, but energy filled. There is hints of anise, mineral, truffle and earthy notes as well as new leather and cedar spiced wood shadings in this medium weighted wine that feels impressive in the mouth and lingers on the finish, this is easily the best Dolcetto of the vintage I’m tried, this is very tasty and very special stuff from Vajra, this and his 2011 Barolo lineup are must have knockouts. Drink the Coste & Fossati Dolcetto D’ Alba 2012 over the next 3 to 5 years, best from 2015 to 2020.